Pulmonary atresia is a congenital heart defect, where the child was born with the condition at birth. Doctors typically diagnose pulmonary atresia within hours or days after birth. 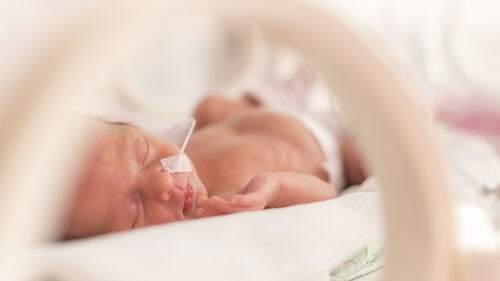 The condition involves a defect in the valve that delivers blood into the baby's lungs that will close instead of opens due to a solid sheet of tissue that is formed by mistake. The malformed pulmonary valve restricts blood flow from the normal route into the lungs to become oxygenated. Instead, the lung receives blood through another natural passageway in the heart and arteries. While these other natural passageways are a necessary component to the development of the fetus in the womb, they are designed to close after the child is born. Usually, pulmonary atresia is considered when the baby displays a bluish tint in their skin due to oxygen deprivation. Without appropriate treatment, the condition can be life-threatening. Doctors typically perform corrective procedures to ensure the baby's heart functions normally. Who Is at Risk for Pulmonary Atresia? Medical science has yet to determine the exact cause of pulmonary atresia. It is thought to be a congenital disease that develops in the early stages of pregnancy. The problem involves a defect that occurs in the pulmonary arteries that deliver blood from the heart to the lungs to be oxygenated and deliver oxygen and nutrients to every organ and tissue cell in the body. While the valve is designed to allow blood flow in one direction, the defect prevents that action due to a structural issue when the valve opens and closes. The defect is not life-threatening to the fetus prior to being born. This is because the baby receives oxygen to the mother's placenta instead of through the lungs. However, after the child was born, the lungs must function properly by providing oxygen to the body. Because of the defect, the low blood looks for other routes to reach the lungs and uses the child's ductus arteriosus (a temporary connection) the connection between the pulmonary artery and the aorta. The deprivation of oxygen caused by the child defect, the newborn's lips, skin, and nails will turn a blue or gray tint. Taking certain drugs while pregnant including those to treat acne with the active ingredient isotretinoin including Amnesteem, Claravis, and others along with anti-seizure drugs and medications to treat bipolar disorder. If pulmonary atresia is left untreated, the results are nearly always fatal. While many surgical repairs are effective, some require carefully monitoring the child's health in the years ahead to quickly identify any problem associated with the defect or the repair. In addition, individuals with pulmonary atresia and other structural heart problems have a higher chance of developing infectious endocarditis compared to others without heart defects. This bacterial infection inflames the heart's inner lining and valves. Not all cases of pulmonary atresia are diagnosed at the hospital. If the parents take the child home and the newborn develops any of the common symptoms associated with pulmonary atresia, the family should seek out immediate emergency medical attention. X-ray – Using x-ray technology, the doctor can receive a visual image of the shape and size of the child's internal bones, tissues, and organs. The x-ray also reveals the extent of pulmonary atresia. Electrocardiogram (ECG) – The doctor may order an ECG where wires with sensor patches are attached to the child to receive electrical impulses and provide information on the function of the heart. And ECG can detect arrhythmias and dysrhythmias (abnormal heart rhythms) and any stress occurring to the heart muscle. Echocardiogram – This machine uses sound waves to create a highly detailed image of the heart. This information is essential to accurately diagnosing pulmonary atresia. However, an echocardiogram can be used when the child is still in the womb to detect any abnormality for birth. Cardiac Catheterization – The doctor inserts a flexible, thin catheter tube) in a blood vessel found in the groin. The tube is then guided to the child's heart. The results of the test provide accurate details about the structure of the heart, oxygen levels, blood pressure and other vital information concerning the heart muscle, eight order and pulmonary artery. Sometimes, the doctor will inject the special dye into the flexible tube to make the arteries highly visible when taking an x-ray. Usually, pulmonary atresia is an emergency. Drugs – The doctor can prescribe intravenous medications to stop the natural closure of the ductus arteriosus that occurs after the child was born to ensure it continues to deliver blood between the aorta and pulmonary artery until a repair can be made. Catheterization Procedures – As an alternative to surgery, the doctor may recommend a catheterization procedure where a thin, long catheter (tube) is inserted into a large vein in the groin area before being threaded into the heart. Stent Placement – A rigid stent (tube) can be positioned between the aorta and ductus arteriosus (artery) to keep it open and allow the flow of blood travel into the lungs. Balloon Atrial Septostomy – The doctor can insert a balloon into the large foramen ovale (the natural whole) in the wall of the heart between the two upper chambers. Normally, the hole will close on its own after birth. Instead, the surgeon enlarges the hole to allow blood flow into the lungs. Radiofrequency Ablation and Balloon Valvotomy – Sometimes, the baby is born with fused cusps of the pulmonary valve that can be corrected using radiofrequency ablation where a small hole in the center of the valve is created by using a wire before a balloon is inserted to open the cusps. In some cases, surgeries the only option, where the doctor will prepare the defective pulmonary artery using shunting, the Glenn procedure, Fontana procedure, or ultimately, a heart transplant when the defect has caused too much damage to the heart muscle.